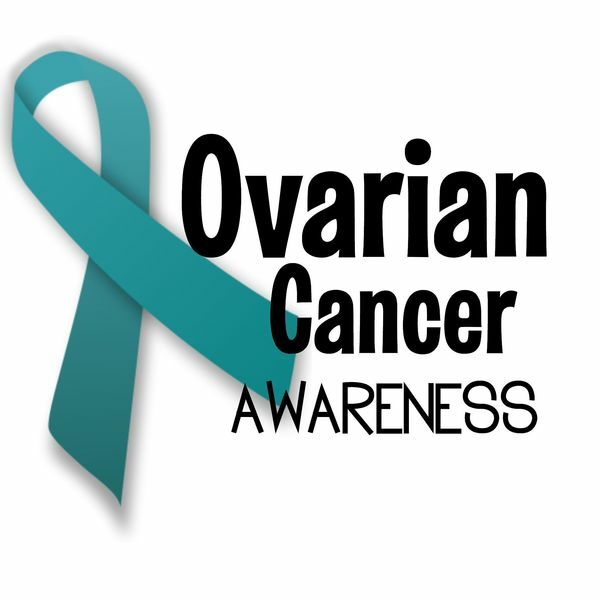 September is National Ovarian Cancer Awareness month. Many of us will wear the color teal in the form of ribbons, wristbands, headscarves and other gear in support of women with ovarian cancer. Are color-coded cancer ribbons just another marketing gimmick, or is there a more important purpose? Whether you are a cancer survivor, a patient in treatment, a family member or a concerned friend, conversations about cancer are challenging and are never easy to start. When I see a stranger wearing a teal ribbon, I always mention that I am an ovarian cancer research advocate. This usually opens the door to a discussion about ovarian cancer. Ovarian cancer is the most common gynecologic malignancy and the 5th most frequent cause of cancer death among US women. Approximately 22,240 women in the US will be diagnosed with ovarian cancer this year, with a new diagnosis every 24 minutes. Because of the subtle symptoms of ovarian cancer*, most women are diagnosed with more advanced cancers. With a 46.5% overall 5-year survival rate, about half of these women will ultimately succumb to their disease. But when diagnosed in the early stages, the 5-year survival rate is over 90%. Nancy White, a 22-year ovarian cancer survivor, leads the Gyna Girls, a gynecologic cancer support group in South Bend, IN affiliated with RiverBend Cancer Services. Nancy advises women to “Know your body. Check out changes lasting more than two weeks. You have to be your own best advocate and arm yourself with knowledge”. Clearly, additional research is needed to improve the survival of women with ovarian cancer. The Midwest Ovarian Cancer Coalition (MWOCC) was initiated by the Harper Cancer Research Institute (HCRI) in 2012 as a consortium of translational researchers and clinicians from the midwest region with a focus on ovarian cancer. Comprised of members from 13 universities, the mission of the MWOCC is to foster collaborative alliances to expedite innovative research that contributes to a cure for ovarian cancer through a better understanding of disease initiation and progression, early detection and new therapeutic approaches. A hallmark of the MWOCC is the collaborative design of a group project every 2-3 years. The goal of this approach is to combine both intellectual and financial resources to generate new knowledge and/or research tools that can be made widely available to the ovarian cancer research community to more rapidly advance the state of the science. The group meets every two years, supported by the Leo and Ann Albert Charitable Trust, to discuss research progress and design new group projects. Results have included publications describing new experimental models with which to study ovarian cancer and an analysis of the in vivo growth properties of multiple high grade serous ovarian cancer cell lines. Many MWOCC members contributed to a special volume of the journal Cancers characterizing the tumor micro-environment of high grade serous ovarian cancers. Encouraging open and transparent collaboration through the MWOCC to ultimately improve the lives of women with ovarian cancer aligns strongly with the mission of the HCRI, established with collaboration as a foundational principle. Metastasis induces cellular stress. 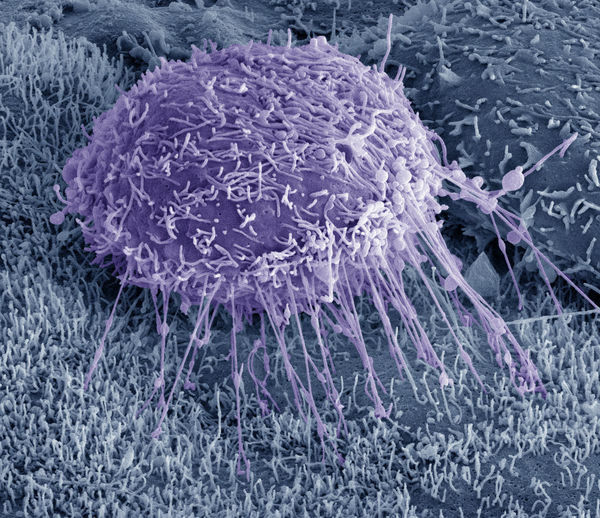 Metastasizing ovarian cancer cells (purple) connect with other cells using “tunneling nanotubes” to escape cellular stress associated with metastasis. Scanning electron micrograph by graduate student Marwa Asem in the Stack laboratory. Within the HCRI, ovarian cancer researchers are working to better understand early detection through the design and application of advanced imaging technologies and are investigating novel nanoparticle-based therapeutics. We are evaluating alterations in the DNA that promote disease progression and metastasis. We are also examining “host” factors including parity, obesity and age that may impact ovarian cancer incidence or progression. Together these projects are uncovering potential new targets for pre-clinical therapeutic development. The stranger you see this month wearing a teal ribbon may be in treatment herself, or she may have just lost a mother, a sister, or a friend to ovarian cancer. The ribbon represents an opportunity to share your compassion, to spread awareness of ovarian cancer symptoms*, and provide hope through advances in collaborative ovarian cancer research. Originally published by M. Sharon Stack, PhD at harpercancer.nd.edu on September 12, 2018.